The first time I stumbled upon this discreet restaurant I was wandering around my neighborhood not having the slightest hope of finding such a place. It’s a really small, domestic and comfortable venue, suitable for almost every kind of situation. All around you you’re surrounded by wines, compotes and paintings and you will eat at a few meters distance from the counter where all the cheese and cured meats are displayed, inevitably increasing a well placed drool for tasting those delicious, specifically chosen products. The courses, served on wooden cutting boards consist of products bought from local producers, skipping intermediaries and based on the owner’s personal and expert tastes. 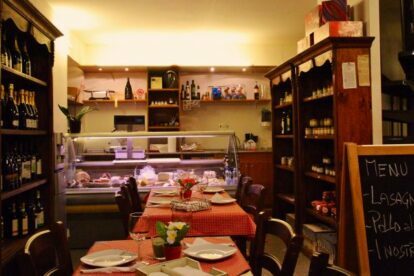 She herself is present, serving and explaining the possible choices and advising the best matches between a broad and quality set of honey, wines, cheese and whatever you could imagine in a typical Italian kitchen or in the best gastronomy. The feeling is exactly that of being at my own place, only surrounded by art and flavors and overwhelming smells too; all served with cordiality and vivacity but still leaving space to find a super discreet spot for a vis-a-vis meeting.